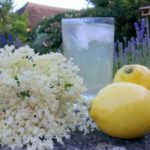 What could be more English than a glass of homemade elderflower cordial drunk in an English garden in the evening of Midsummer’s Day? I picked the elderflowers on Midsummer’s eve and bottled them on Midsummer’s day. Today is Midsummer’s day and for those of us in the Northern hemisphere the longest day of the year, for those in the Southern hemisphere it is the shortest day, and they now have the pleasure of looking forward to longer days and the coming of spring. Such are the vagaries of English weather the middle of June often feels like late spring and although the today middle of that day was baking hot there distinct chill at either end; at 10pm I am sitting in a fleece at my computer. 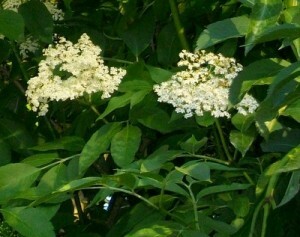 The delicate spring like elderflower abounds during June, seemingly in every hedgerow and garden. I love the idea of foraging from the countryside and cooking with my bounty. Elderflower cordial is the obvious thing to make with my flowers. I also was thinking of a delicate jam or jelly – perhaps pairing them with rhubarb or gooseberries, but in my limited time the cordial won. Naturally the best blooms were situated over a bed of nettles, so I dressed in my best protective clothing of wellies, jeans and a long sleeved top and waded in; brandishing my secateurs! I am delighted to have discovered a simple way to preserve my cordial; seemingly indefinately so it no longer needs to be kept in the fridge. When the elderflowers start to come into bloom start to save your screw top wine and spirit bottles to decant your cordial into. If you try this My Midsummer Night’s Dream – Elderflower Cordial please tag #FussFreeFlavours on Instagram or Twitter. It is amazing for me when for me when you make one of my recipes and I really do love to see them. You can also share it on my Facebook page. Please pin this recipe to Pinterest too! Thanks for reading Fuss Free Flavours! The quintessential English summer drink. Pick your elderflower heads and give them a very good shake as they will be full of bugs. Place in a bowl, slice the lemons (or oranges) and add to the elderflower blooms.